These marinated lamb chops are full of flavour and always go down a treat with the whole family. Combine 1tbsp Olive Oil in a bowl with the garlic, thyme, rosemary and salt. Add the lamb and coat in the flavoured oil then allow to marinate for approx 30 mins - 1 hour. Meanwhile, prepare the baby potatoes. Place the potatoes in a large pan of salted water and bring to the boil. Simmer for 20 minutes until softened. Remove from the heat and slice into 5mm thick slices. Preheat oven to 200˚C/400°F/Gas Mark 6. Heat remaining 1 tablespoon of olive oil in a heavy large ovenproof pan over high heat. Add the lamb chops and cook until browned, about 3 minutes per side. Next add the potatoes slices and mustard. Continue to colour for another 3-4 minutes. Season well then transfer to the oven. 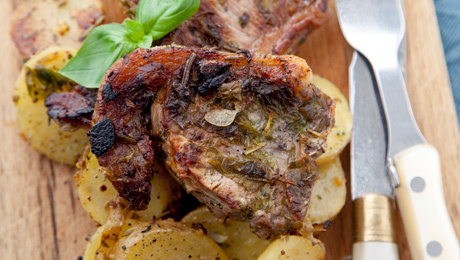 Roast lamb chops with the potatoes for another 10 minutes. Serve immediately with seasonal vegetables of your choice.